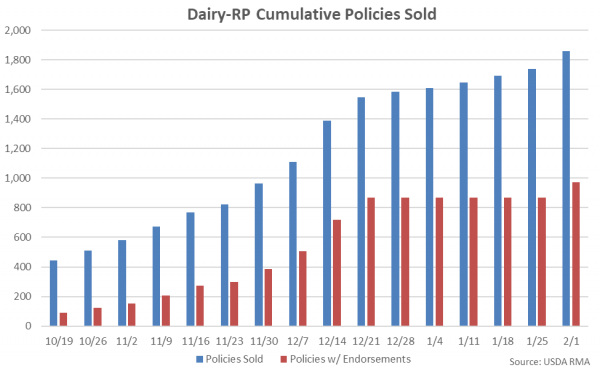 There were 1,859 Dairy-RP policies sold through the week ending Feb 1st, with 971 of the policies having active endorsements. Wisconsin led all states in the number of policies sold with active endorsements, followed by Minnesota, California and Idaho. Sales of Dairy-RP policies were suspended from Dec 24th to Jan 25th due to shutdown of government operations. Dairy-RP policies sold through the week ending Feb 1st have covered a total of 13.49 billion pounds of milk, the equivalent of approximately 67,200 Class III milk contracts and 6.1% of total 2019 USDA projected milk production volumes. 88% of all milk covered has been at the 95% coverage level. 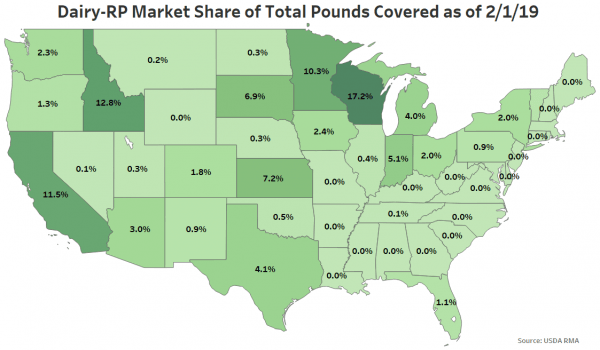 Wisconsin has led all states in pounds of milk production covered within the Dairy-RP program through the week ending Feb 1st, followed by Idaho, California and Minnesota. 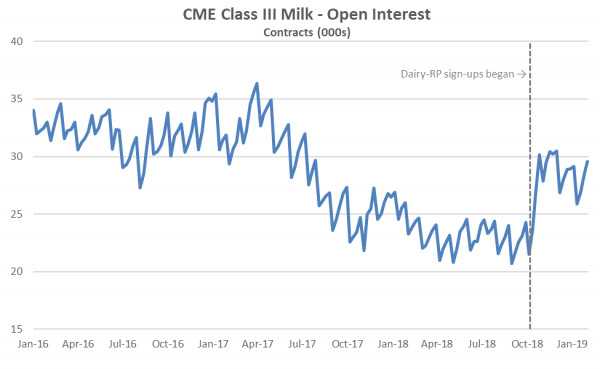 CME Class III Milk volume and open interest figures increased substantially following the initial wave of Dairy-RP sign-ups. Class III Milk volumes reached a 22 month high during Oct ’18 while Class III Milk open interest reached a 16 month high during Nov ’18. There were 1,859 Dairy-RP policies sold through the week ending Feb 1st, up 122 from the previous week. Of the policies sold, 971 had active endorsements through the week ending Feb 1st, up 101 from the previous week. Sales of Dairy-RP policies were suspended from Dec 24th to Jan 25th due to shutdown of government operations. 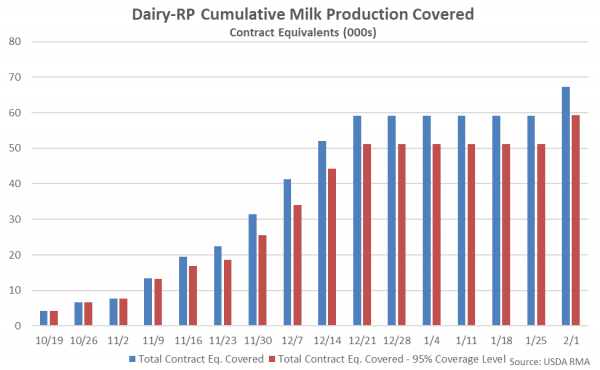 Dairy-RP policies have been sold throughout 35 states through the week ending Feb 1st. Policies with active endorsements have been sold throughout 34 states, led by Wisconsin, Minnesota, California and Idaho. 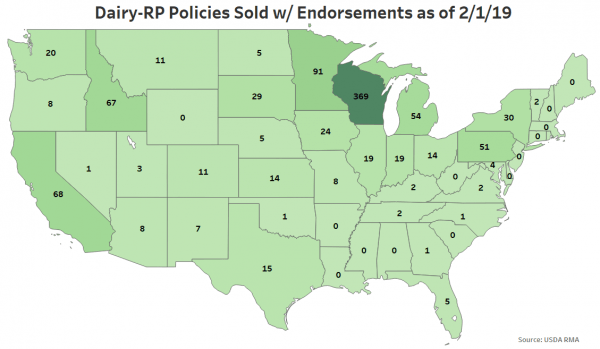 Wisconsin has accounted for nearly 40% of all policies sold with active endorsements through the week ending Feb 1st. Approximately 13.49 billion pounds of milk have been covered through the Dairy-RP program through the week ending Feb 1st, which is the equivalent of approximately 67,200 Class III milk contracts. 88% of all milk production covered has been at the 95% coverage level through the week ending Feb 1st. Wisconsin has led all states in pounds of milk production covered within the Dairy-RP program through the week ending Feb 1st, followed by Idaho, California and Minnesota. Dairy-RP milk production volumes covered through the week ending Feb 1st are equivalent to 6.1% of total 2019 USDA projected milk production volumes. 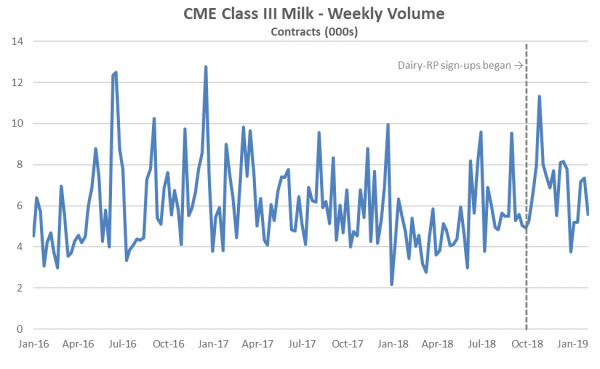 For comparison, CME Class III Milk open interest as of the week ending Feb 1st was equivalent to 2.7% of 2019 projected production volumes.